Do you know how to split pdf file into many parts ? or how to merge multiple pdf files into one big file ? If not then consider PDFill PDF Tools, This is a free desktop utility program which lets you to split any pdf file into smaller pdf files or lets you to combine PDF files into a single document with more flexibility and control. You can use this tool to Merge(combine PDF), Split pdf files, Reorder pdf files, Encrypt pdf files, Decrypt pdf files, Rotate pdf files, Crop pdf files, Reformat pdf files, Header, Footer, Watermark pdf files, Images to PDF, PDF to Images, Form Fields Delete/Flatten/List, and PostScript to PDF. Windows Vista, Windows 95, Windows Me, Windows XP, Windows 2000, Windows 98 are supported. 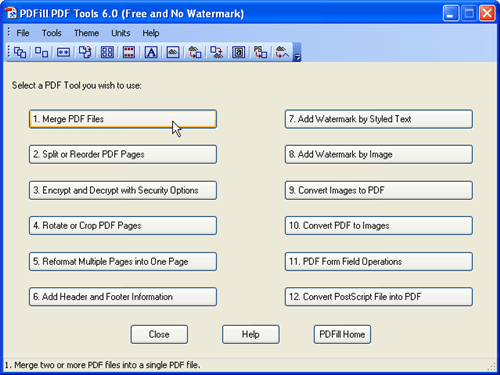 Unlike other software PDFill PDF Tools has no watermarks, no pop-up advertisements. This software is free for personal or commercial use with free support. Download PDFill PDF Tools here for free. Related Read: If you want to convert word (.doc) to PDF file (.pdf) use Doc2pdf. I found this wonderful online application to watermark pdf files.